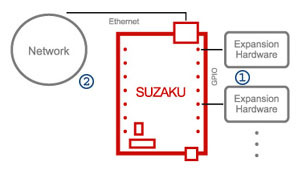 The SUZAKU are a series of small form-factor general purpose embedded computer boards. As embedded boards, they have been designed to be easily integrated with the target system, while at the same time having the functional power to operate as complete and separate system units. are utilized in the SUZAKU series. FPGA bring speed and software-like flexibility to hardware development, and the use of Linux and other open source software leads to increased software development efficiency and flexibility. The applicability of SUZAKU surpasses that of other CPU boards available up until now. On top of the flexible FPGA based hardware, all boards in the series have Ethernet as standard. Then with the choice of a high speed processor, SUZAKU truly have unlimited potential. Expansion Hardware: Using the FPGA, even devices with previously hard-to-handle or non-standard interfaces can be easily connected. Network: Ethernet (10BASE-T/100BASE-TX) is standard on all boards. 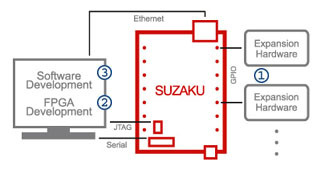 Devices without network functionality can be easily made network ready by embedding a SUZAKU board. FPGA are the SUZAKU's defining feature. Using FPGA, a lot of the development work that has previously been carried out with fixed hardware can now be done in a much more software-like way. With FPGA based on the latest manufacturing processes increasing in scale and decreasing in cost, they now serve as a very good basis for mass produced embedded devices, both in terms of cost and functionality. Unlike with conventional fixed state CPU boards, individual value can be created even while using the same hardware base thanks to the flexibility of FPGA. As Linux is employed as the basic software environment for the SUZAKU, much of the software development can be carried out on a desktop or workstation PC. While of course device specific testing must be carried out directly on the SUZAKU, this is likely to be a very small part of the overall development. This leads to higher development efficiency and shorter development time. A process called cross development is used when testing programs on the SUZAKU. After the development environment has been set up on the PC, the program is compiled and transferred to the SUZAKU. The transfer can be done via the network as well as via serial cable, allowing for a fast transfer of the total system software. System Design: Expansion hardware is considered and overall system design carried out. FPGA Development: Required FPGA cores like hardware-software connecting circuits or specific process accelerators are developed. Software Development: Necessary device drivers and applications are developed.